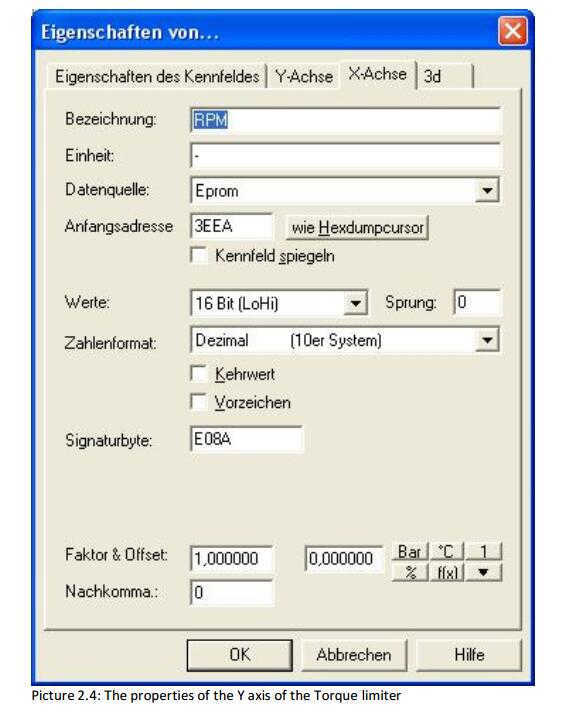 The MSA15 is a much used ECU in VP37 diesel cars like golf 3 TDI 110hp from 1996 on. 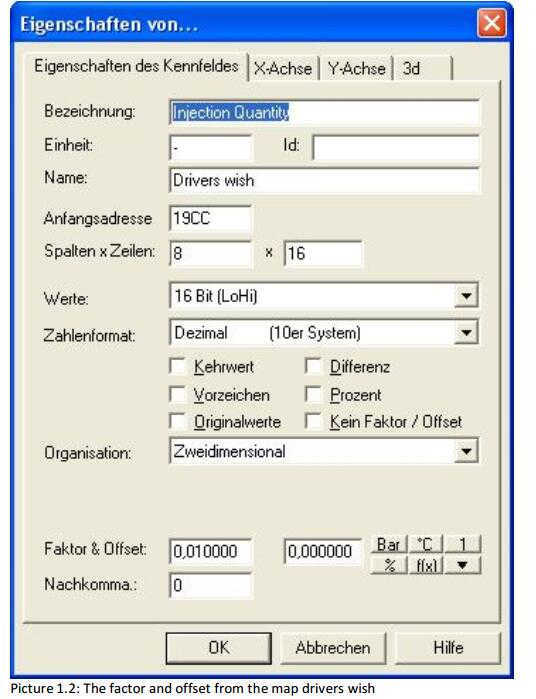 It is used in much more cars, but in the example’s i give i used a 110hp Passat 3B TDI. 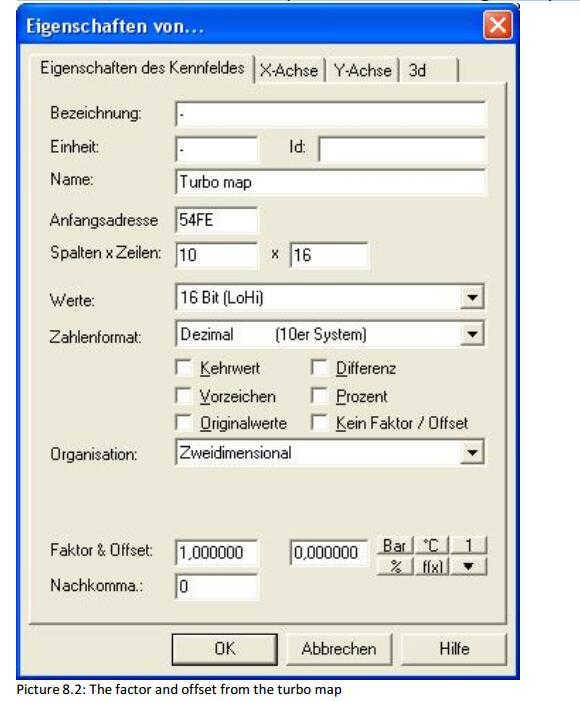 Winols is used to change the maps. 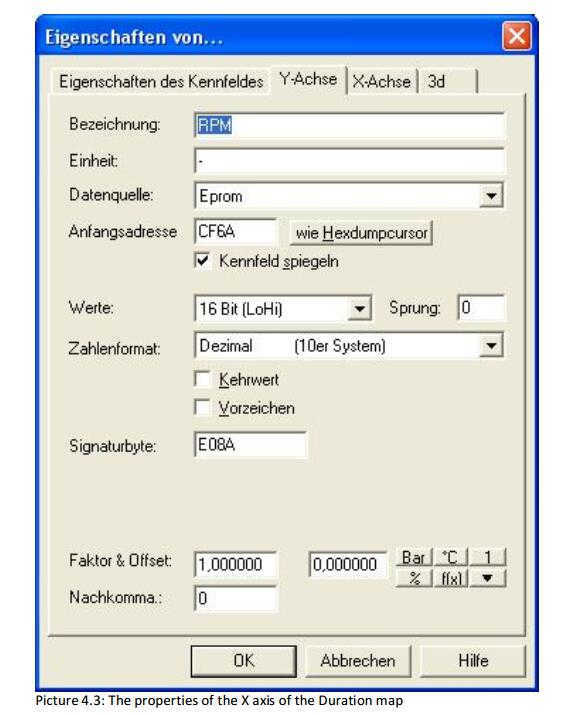 Some MSA15 ecu’s do have more software banks, in my case there were 4 banks of software. There is only one of the four active at a moment but i decided to change all banks. Some ecu’s have one or more banks. 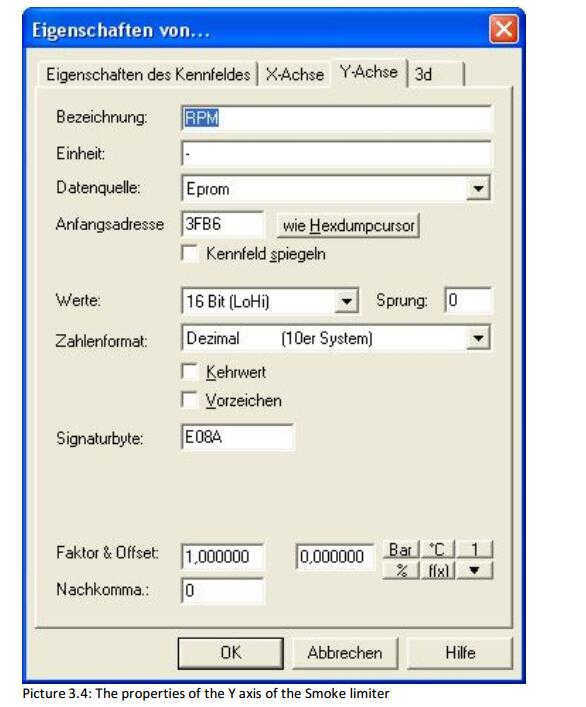 So just to be sure, change all banks exact the same (Winols will do this automatically). The different maps of the MSA-15 can be grouped in 2 groups. The fuel related maps and the turbo related maps. As the name says the fuel related maps control the quantity of injected fuel, and the turbo maps control the turbo pressure. 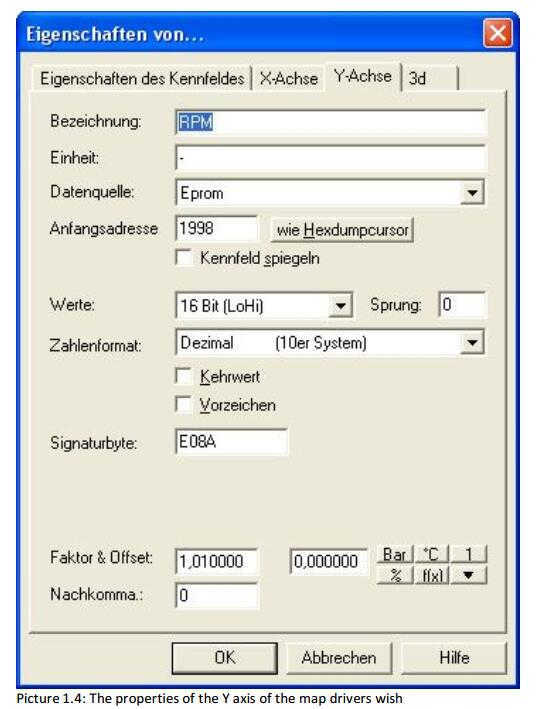 All examples in this document are taken from an original VW Passat 3B AFN VP37 110hp ECU 028906021GL. with 0.216 nozzles! 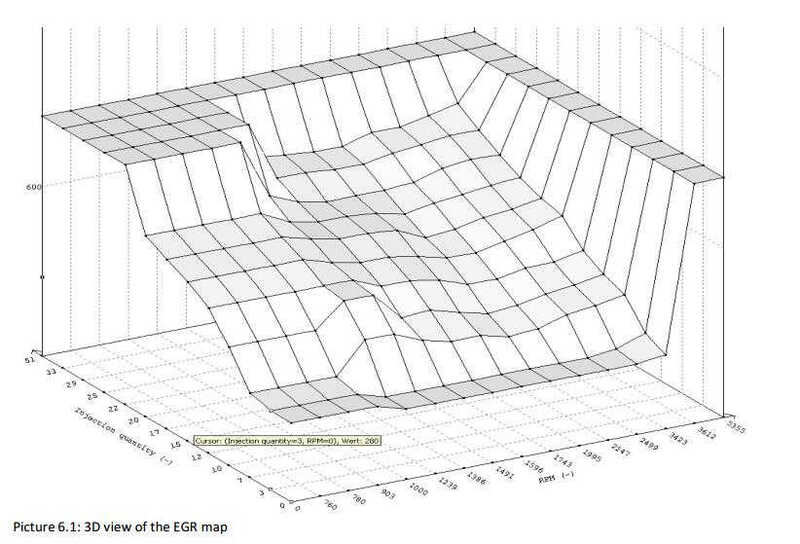 -(EGR map) not really a fuel map, but have to put it somewhere. 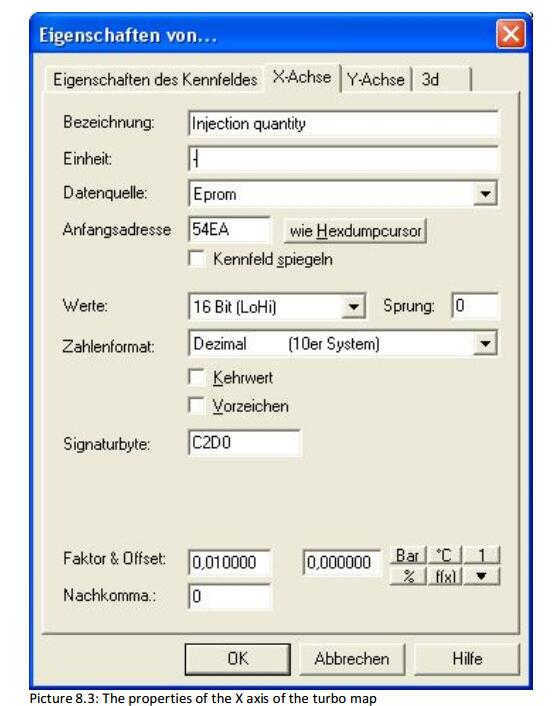 This map shows the required injected quantity diesel into the engine depending on the RPM and the Throttle position. 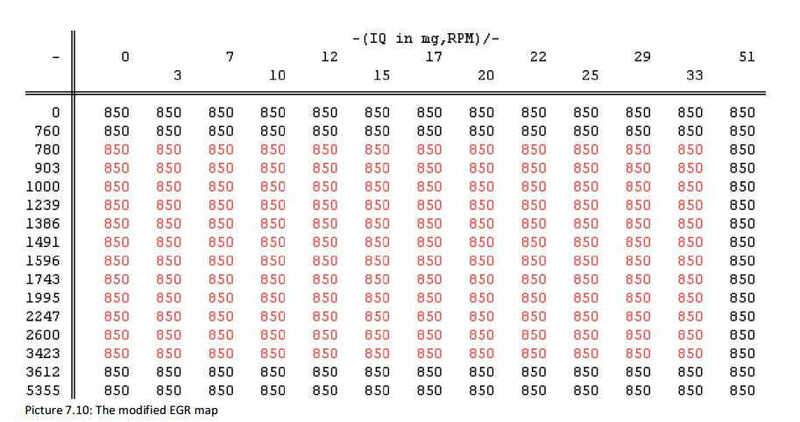 The output of this map is injected quantity (IQ) in mg diesel/stroke. 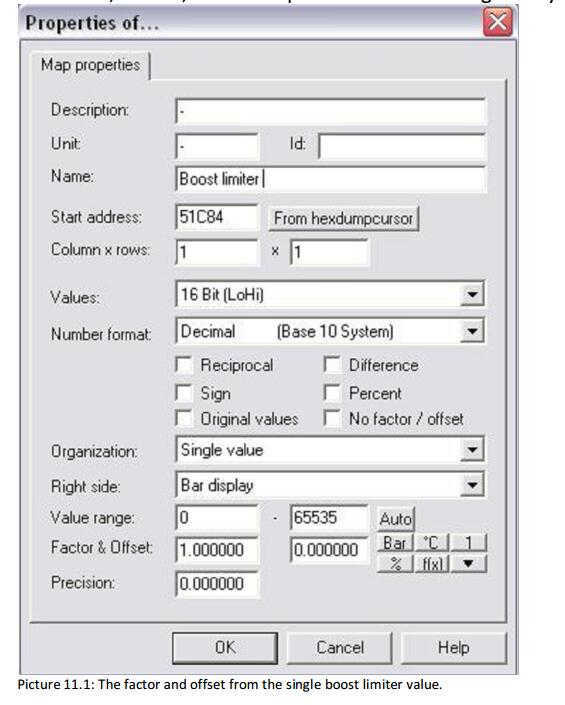 All factors, offsets, axis descriptors and names are given by the pictures below. 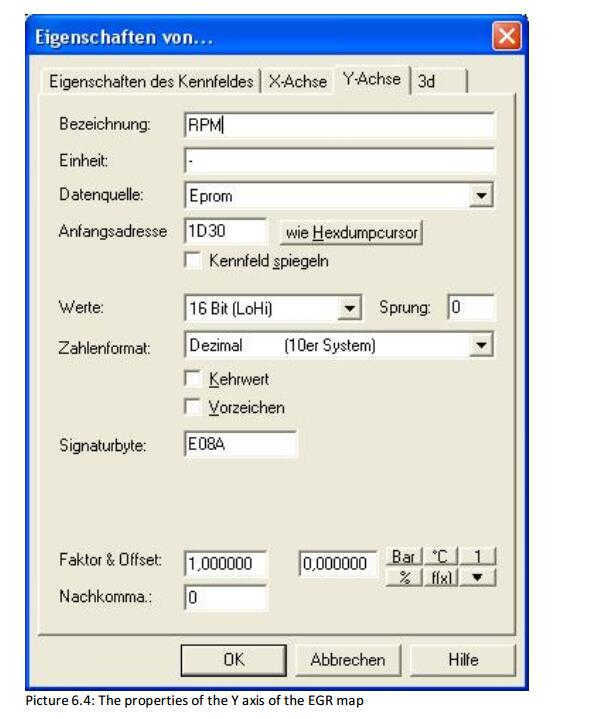 This map limits the torque of the engine based on RPM and atmospheric pressure. 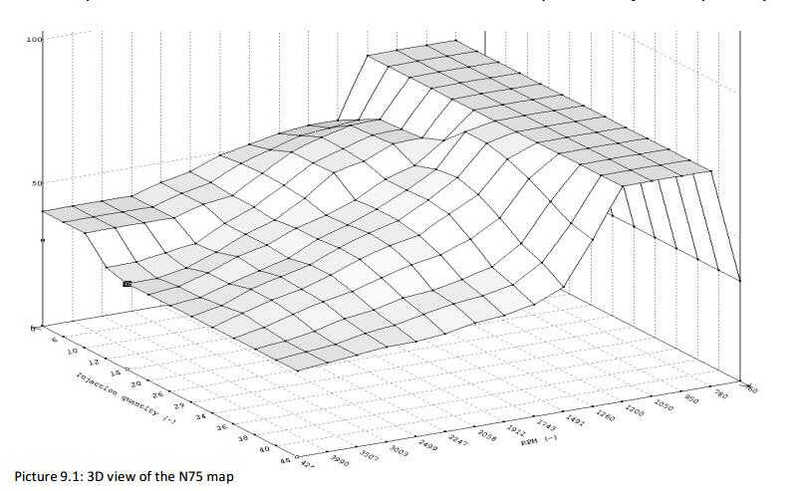 The output of this map is also mg diesel / stroke. 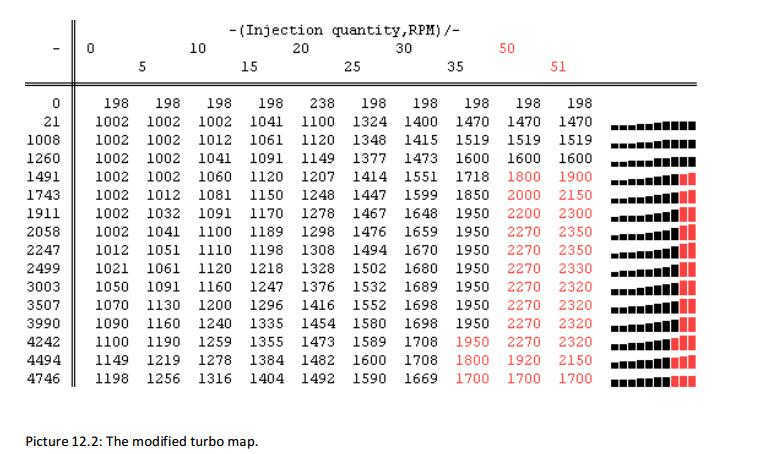 This map limits the injected quantity based on RPM and inlet air. So if the drivers wish is 50mg, and there is only enough air to burn 45mg diesel, it won’t inject 50mg but limit injection at 45mg/stroke. 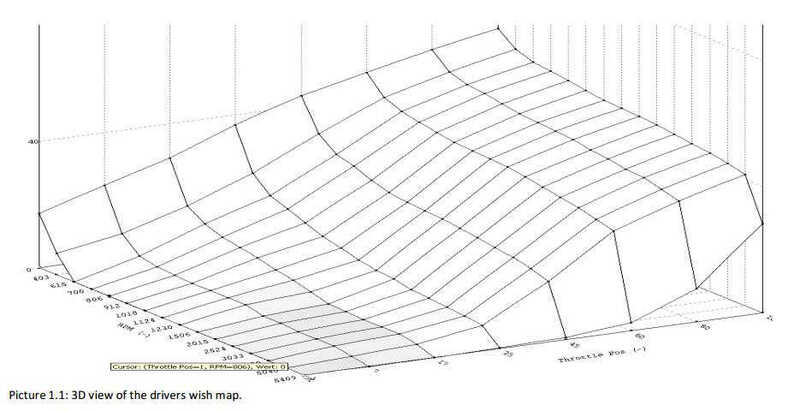 This map shows at which degrees engine rotation the fuel injection starts. 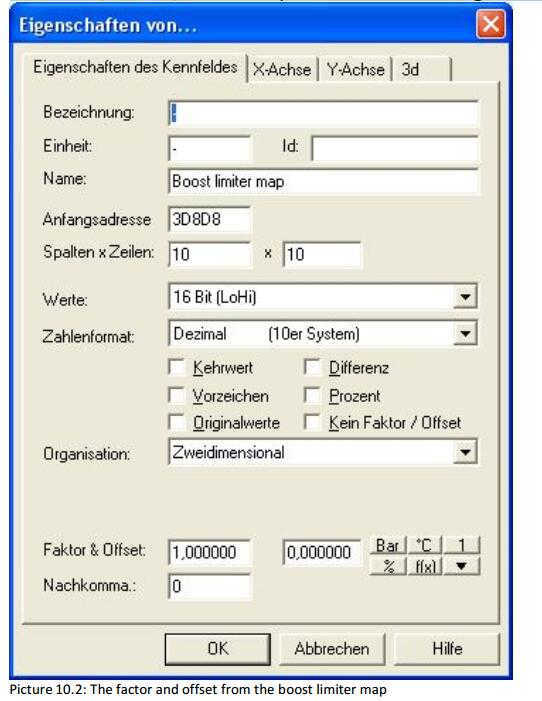 So this is a “calibration” map.Often there is more than one duration map, in case of the 110hp tdi even 4.Positive values are injection start before OT, negative values are injection start after OT! This map regulates the Exhaust gas recirculation valve. 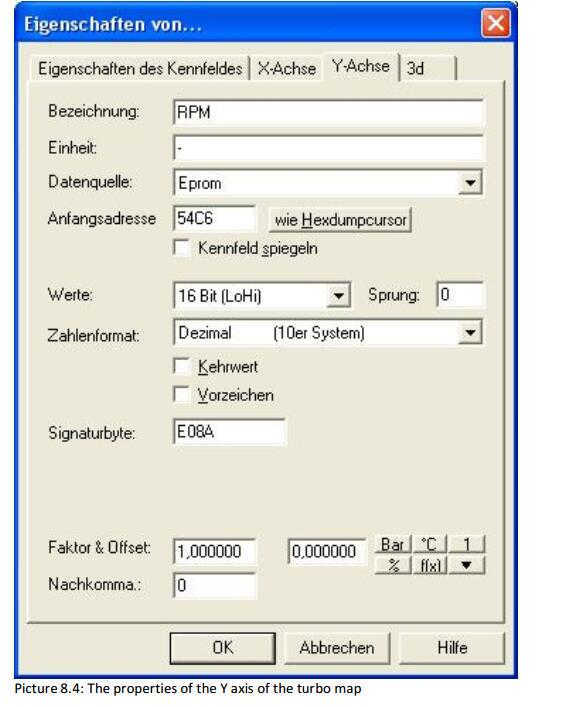 If we want to tune a stock VP engine it is enough to change the drivers wish, torque limiter, smoke limiter,N146 map and the EGR map (and the turbo maps but that comes later on).To give an example look at the picture below. 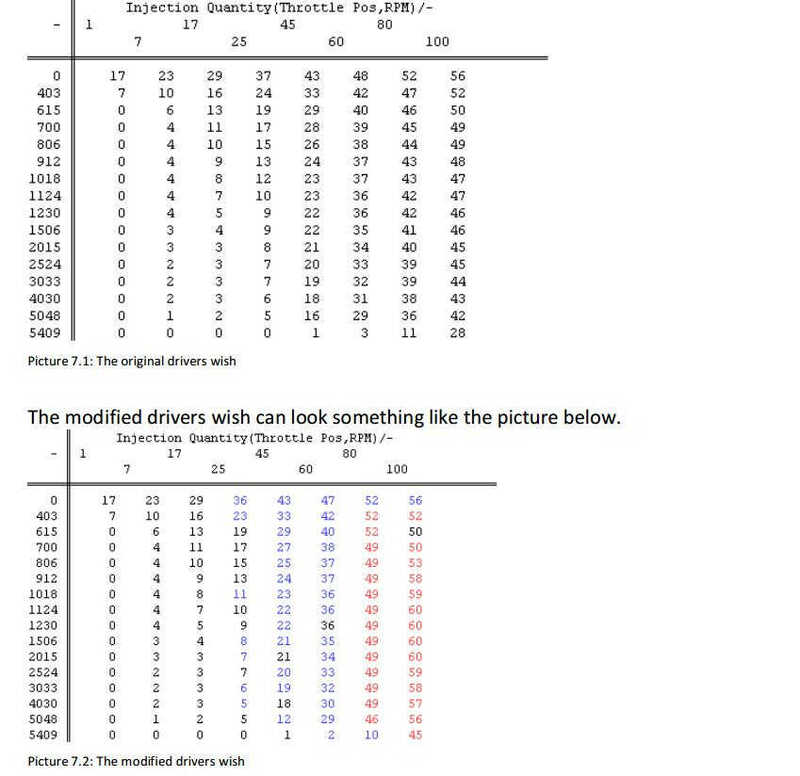 It is an original text view of the Drivers wish. 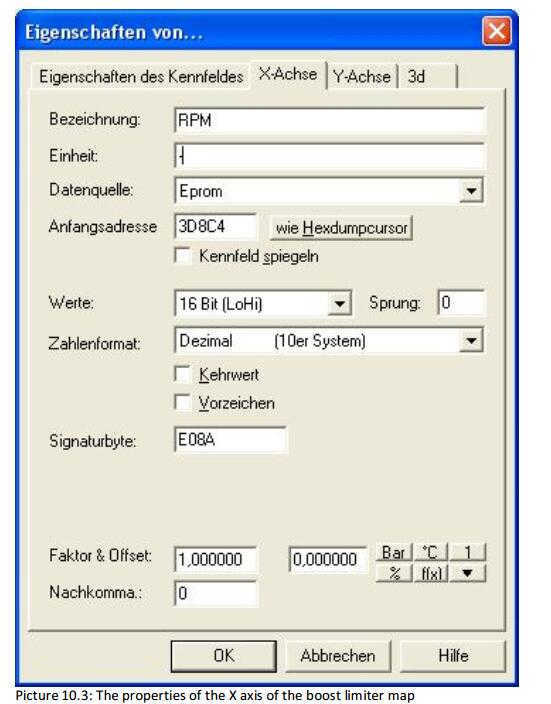 The torque limiter can be increased from 1250rpm to 4800rpm by ± 25%. 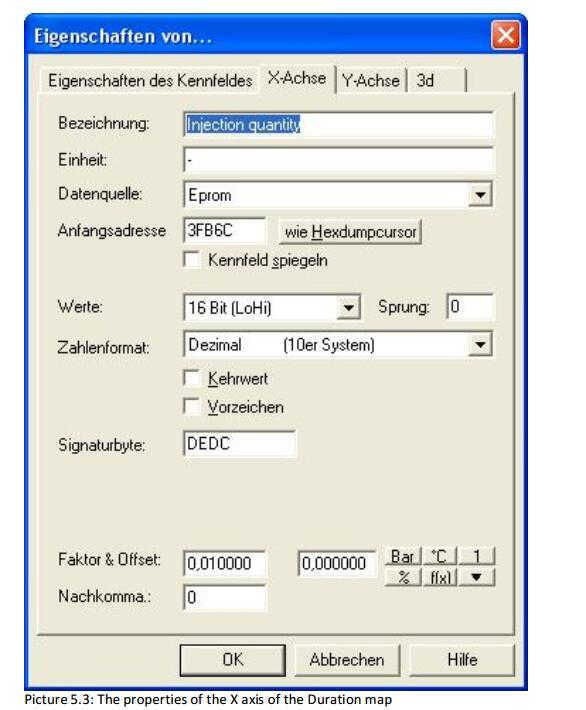 The highest value should be around 2250-2750rpm.The max value is 51mg/stroke in cause of the maximum value for diagnostics is at older VP-TDI´s 51mg! And I don’t know how to change them!!!! To give an example look at the picture below. It is an original text view of the torque limiter. 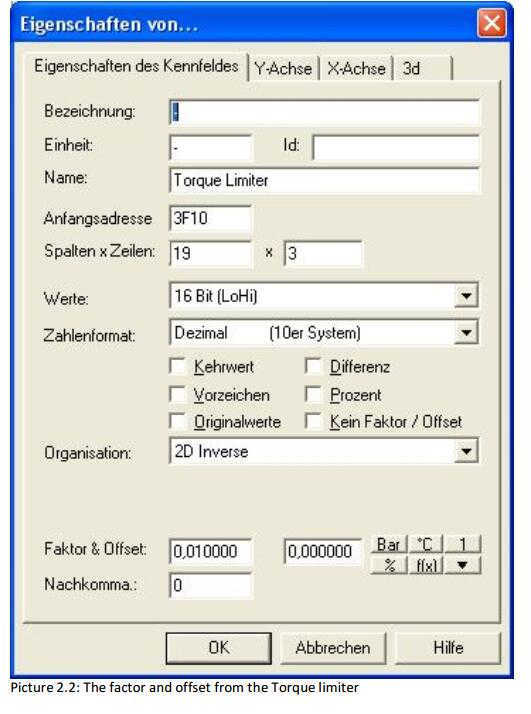 The modified torque limiter can look something like the picture below. 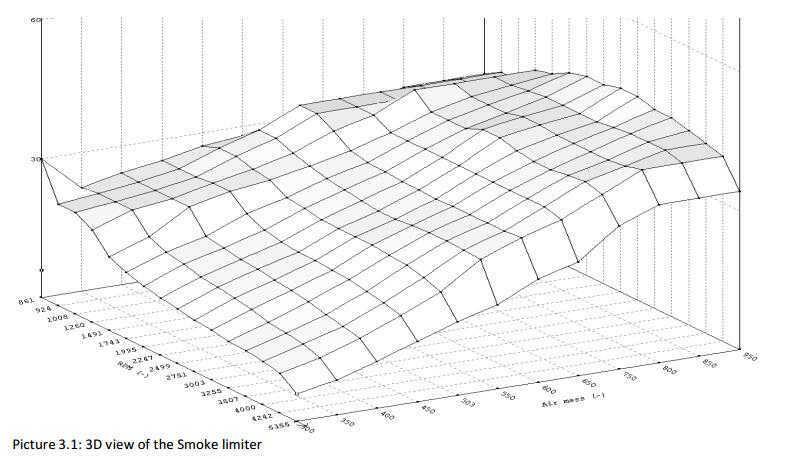 Smoke limiter: As you can see the values (mg/stroke) are increased. At this point the smoke limiter will still limit the IQ. 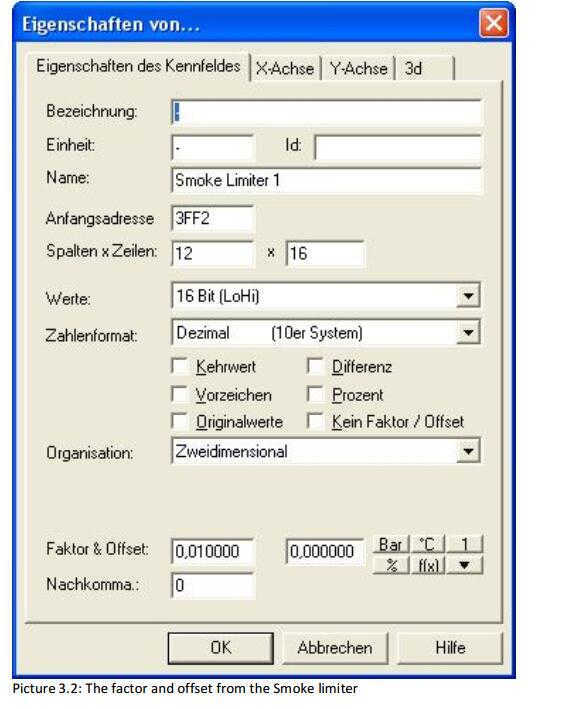 So we need to change the smoke limiter as well. We only want to change the smoke limiter at high IQ’s. 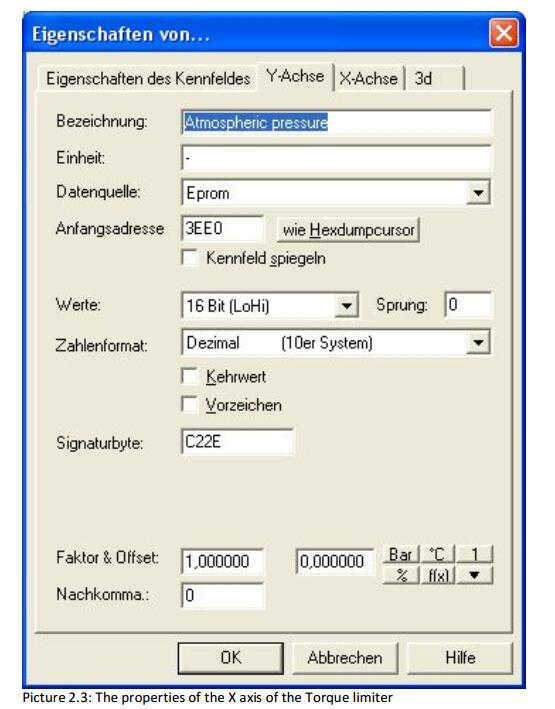 Original the text view of the smoke map looked like the picture 7.5.
by 17 we get: 950/17 = 56mg. 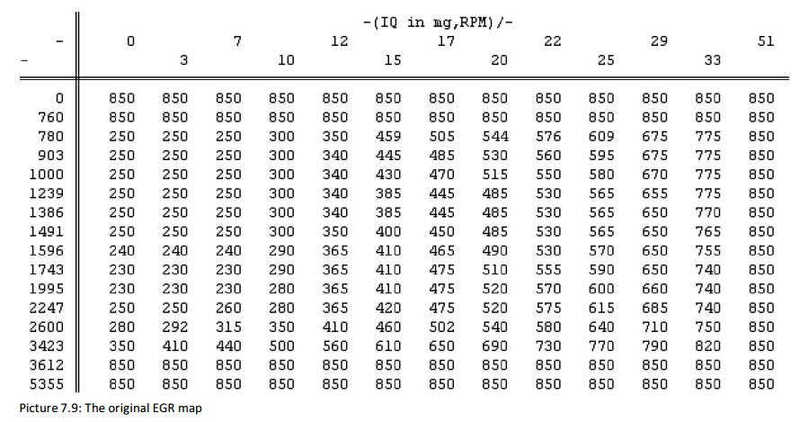 So the max value in the most right column may be 56mg/stroke. 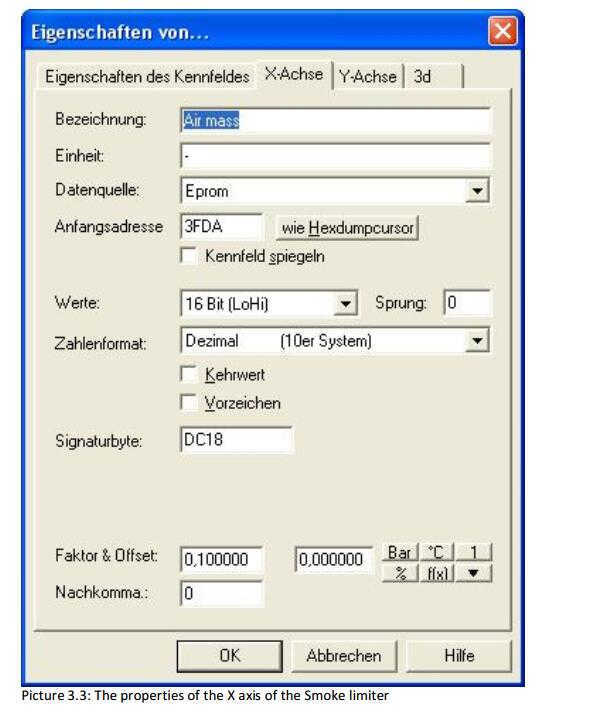 We made the torque limiter 51mg/stroke in cause of diagnostics, so we want to change the smoke map also to 51mg/stroke. 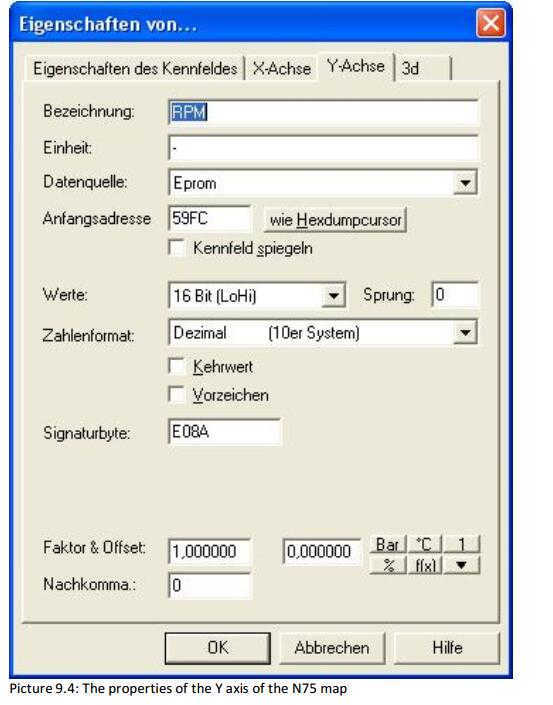 Then the smoke limiter looks like the picture below. 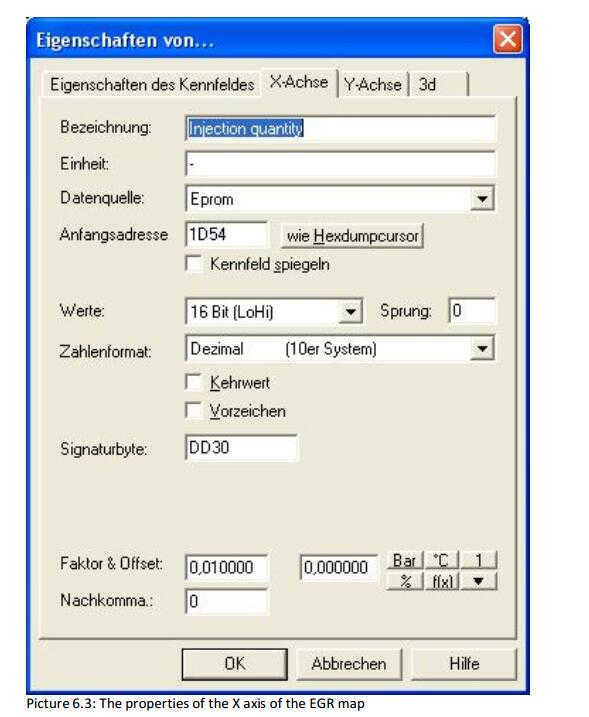 If we want to tune a stock VP engine, there is a problem, that with diagnostic software the highest value for injection quantity is 51mg/stroke! 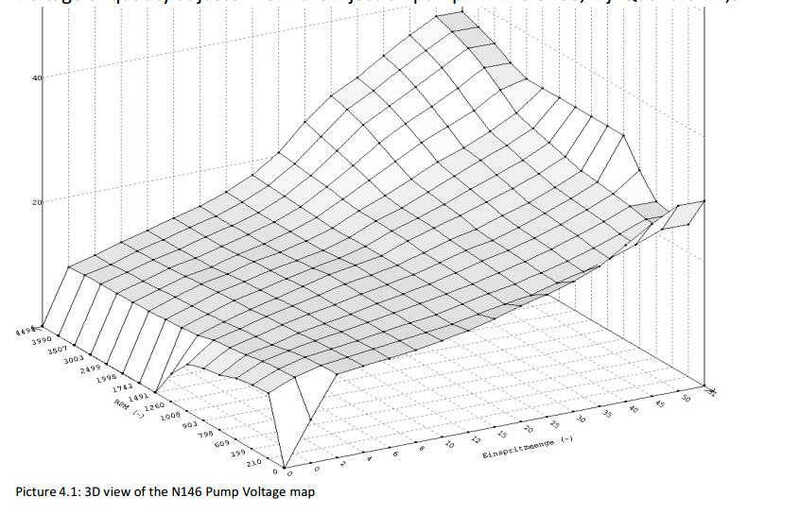 So we make the highest values in our file around 51mg, and then we change the values in the pump voltage map around 10% higher! 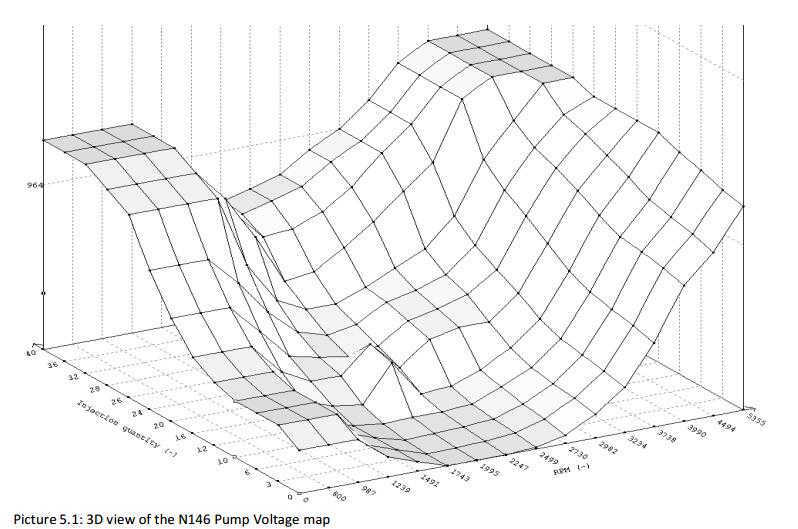 In this case, this is a modified pump voltage map, if you use 0.216 nozzles!! You can change the values at higher rpm and higher injection in the map a littlebit, but in this case, there are bigger nozzles than stock, so there is no need to change the map. To prevent clogged intake and avoid unnecessary smoke the EGR map have to be disabled. 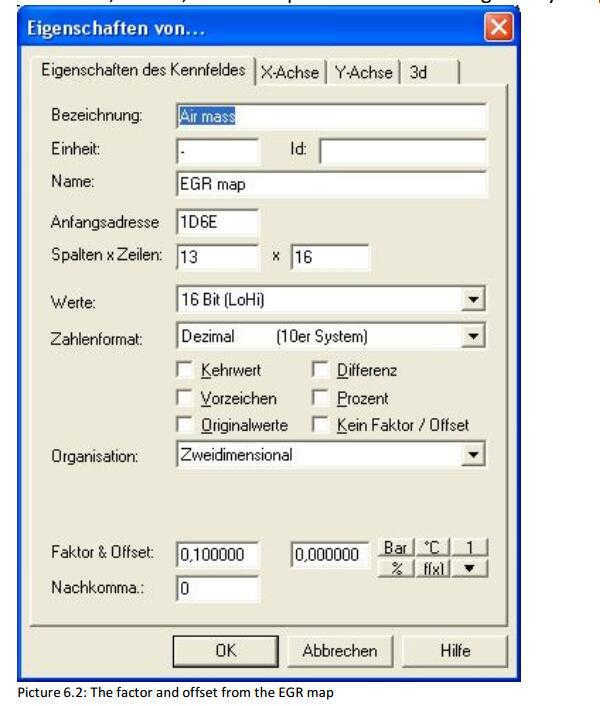 The original EGR map looks like picture 7.9. 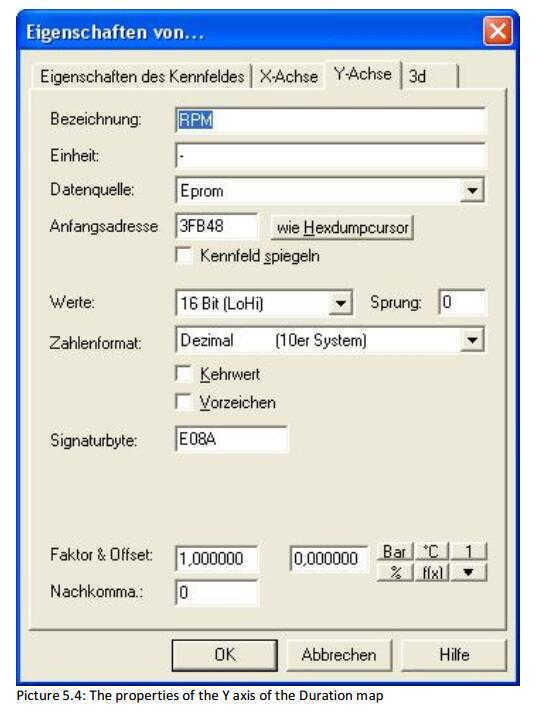 How to disable the EGR map? Pick the highest value from the map, and make the whole map the highest value. In This case it is 850, so we change all values to 850 as showed in picture 6.6. At this point all fuel related maps have been “tuned”. We will continue with tuning the turbo related maps after explaining the basics of those maps. 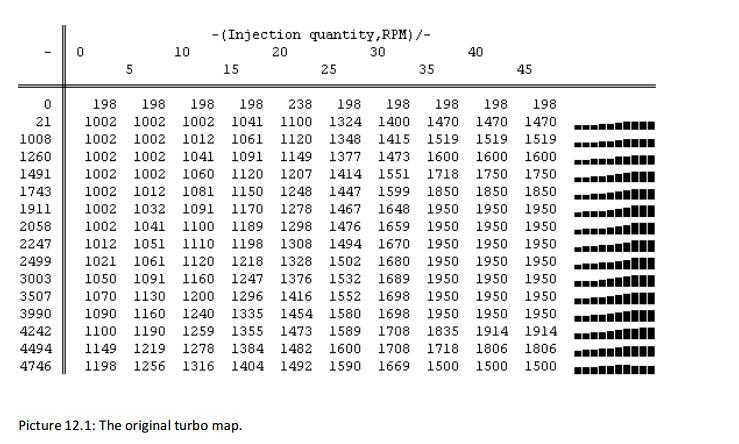 This map shows the desired turbo pressure at a certain rpm and injected quantity. The output of this map is turbo pressure in mbar. 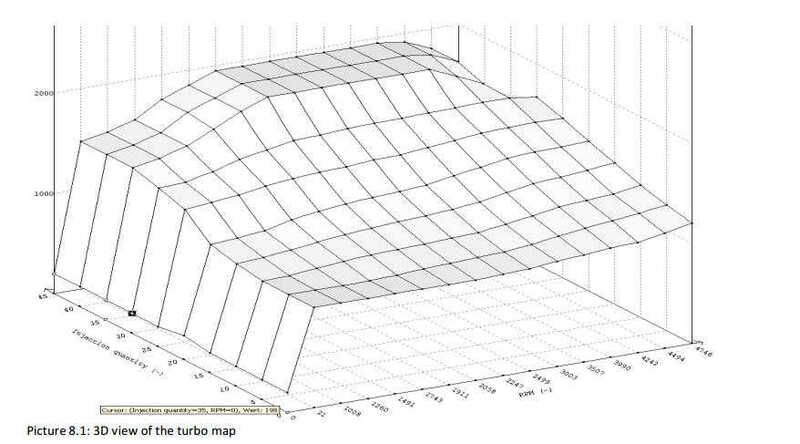 This map controls the vanes inside the turbo at a certain rpm and injected quantity. 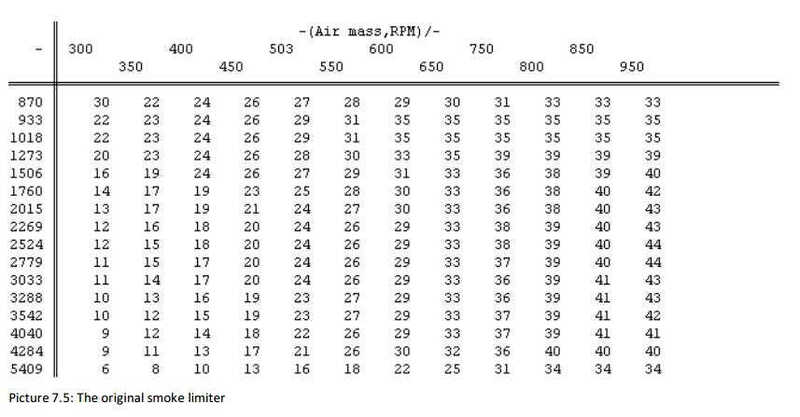 This map limits the turbo pressure at a certain rpm and atmospheric pressure. The output of this map is again in mbar turbo pressure. This value limits the absolute pressure. The boost will (normally) never be higher as this value.To find this single value just look for the value 31455(decimal) or 7ADF(hexidecimal). The boost limiter is located in front of this value. 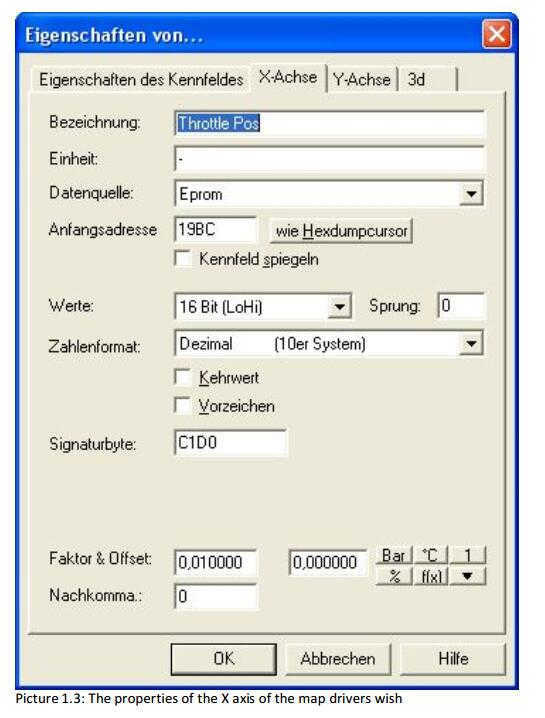 The stock value for the 110 hp TDI is 1950mbar. As you can see the boost goes up to max 1950mbar. The turbo on this car can handle a max boost of around 2300-2350mbar at lower rpm. So the max value in this map may be 2350mbar.Since we are only tuning for max power only the most right column has to be changed! You can say that the turbo pressure may be increased by around 7% max. As you can see the axis value only goes up to 45mg/stroke, while we are injecting 51mg/stroke (set in the torque limiter and smoke map). 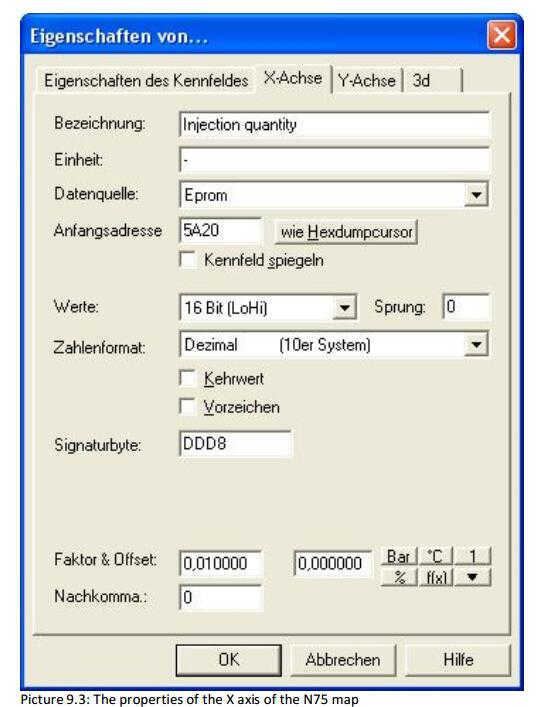 To compensate that we changed the axis values from 40 to 45 and the 45 value to 51mg/stroke. This way the turbo pressure at high IQ’s is easier to regulate. spiking. In the range 1500rpm up to 5000rpm at high IQ’s it needs normally to be higher. 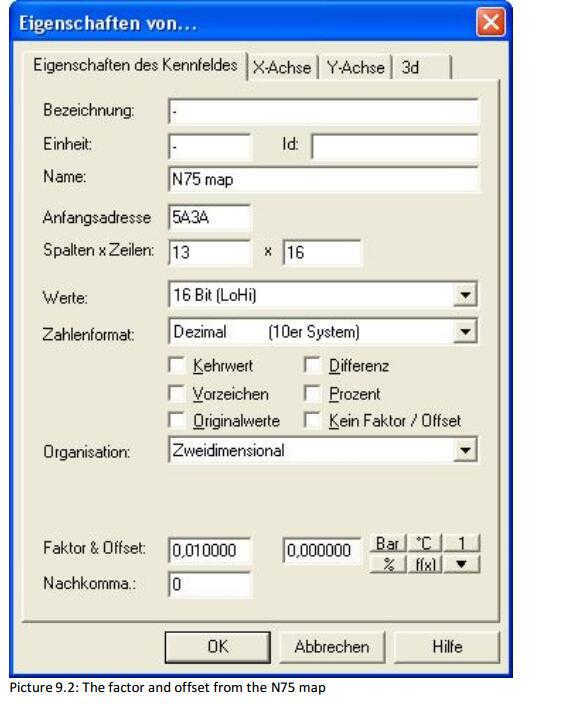 In picture 12.3 you can see the original n75 map. The modified N75 map look like picture 12.4. 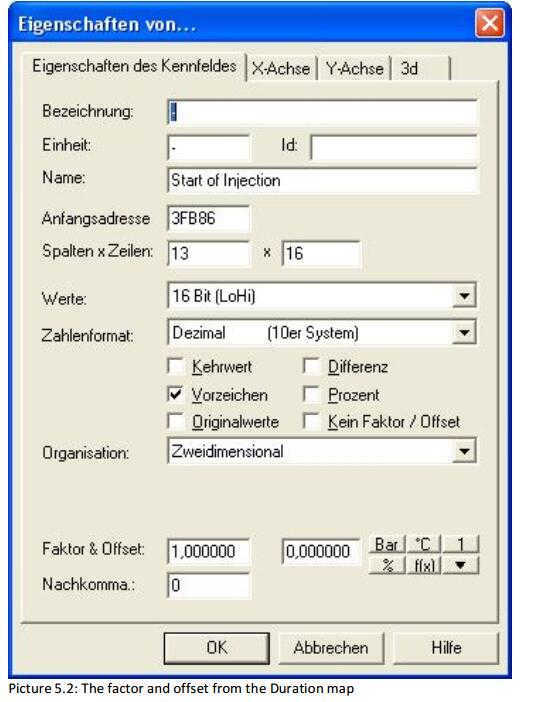 As you can see, again the axis value is changed into 51mg/stroke due to the torque and smoke limiter at 51mg/stroke. As a rule you can increase the values from 1500-5000rpm at high IQ’s by 8%. This is depending on the car, and how much boost spikes you have. still got boost spikes? increase the map. 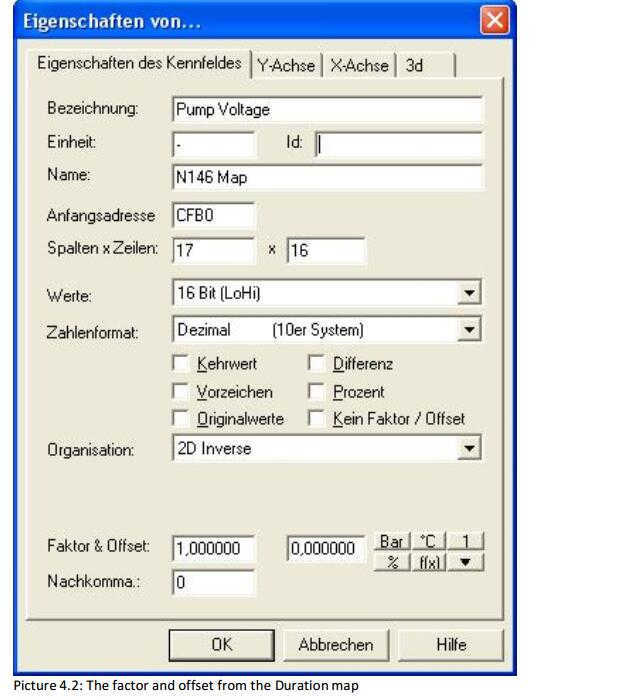 In my knowledge, older TDI´s have most of the time mechanical problems like injection pumps who can´t bring the full injection quantity or even turbos, which are slower by making the boost, so most of the time, you don´t have to change the map!!! At this point we have set the boost up to 2350 mbar in the turbo map, and prevent boostspikes by lowering the N75 map. But the boost limiter map will limit the 2350mbar back to 2150mbar as you can see in picture 12.5. We need to change that values the same way as the turbo map, even a bit higher because this is the limiter. 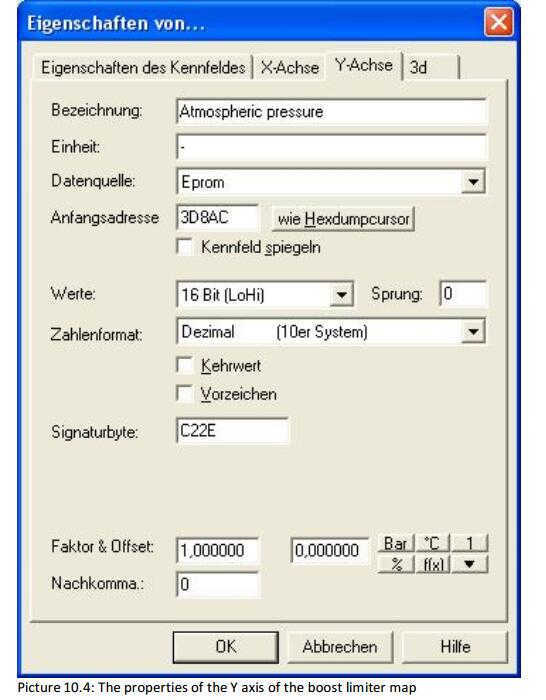 Since we only drive at sea level (1013,25hpa), there is no need to adjust the car at 900hpa and lower(or you live at more than 1000metres above sea level). 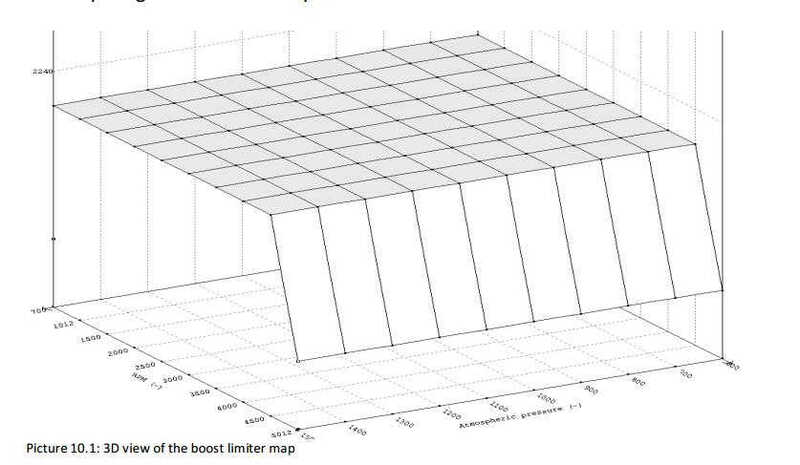 Modified boost limiter map looks like picture 12.6. 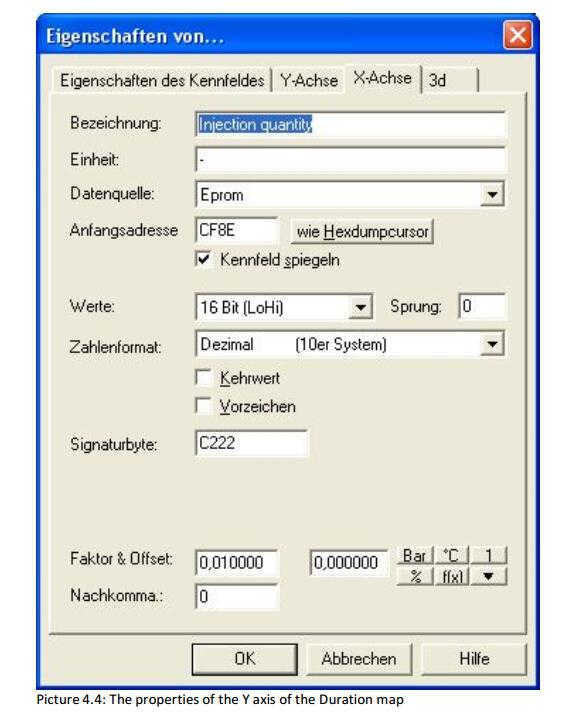 2500mbar is the highest value for the boost sensor! At this point we have set almost everything to get a higher boost except the absolute limiter. That’s the last one we need to change. This value has to be a bit(read 50mbar) higher than the highest turbo map value. So we set this value from 1950mbar up to 2350mbar. All information and values given in this document may be used at own risk. I do not stand in for any problems or blown turbo’s. My special thanks go out to Midas, tjwasiak, dieseljohnny, VectraDTI and Bar who helped me with all this information and tuning advice. I hope you enjoy the information.